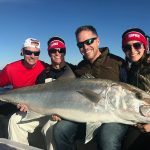 “This giant amberjack wore all three guys out,” according to Capt. Jason Stock. 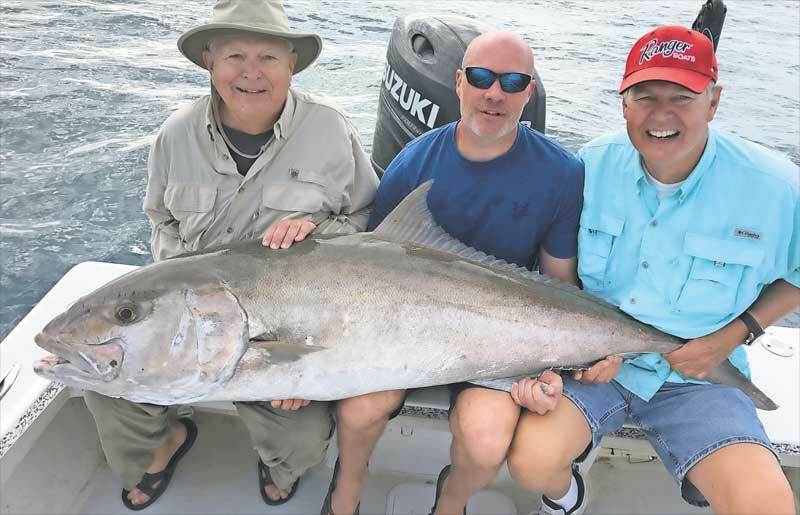 It was the “big dog” of the day, but Stock also led Chicagoans Doug Slinkman, Mike Folkerts and Jack Folkerts to more action on 35-80 pound catch-and-release amberjacks, a hot mangrove snapper bite and a keeper red grouper. Denny Bauman of Nokomis, Illinois, shows off a healthy black drum caught Jan. 12 on a select shrimp while on a charter fishing trip with Capt. David White of Anna Maria Charters. When the seas are calm, it’s a good time to venture into the Gulf of Mexico for snapper, grouper and hogfish. 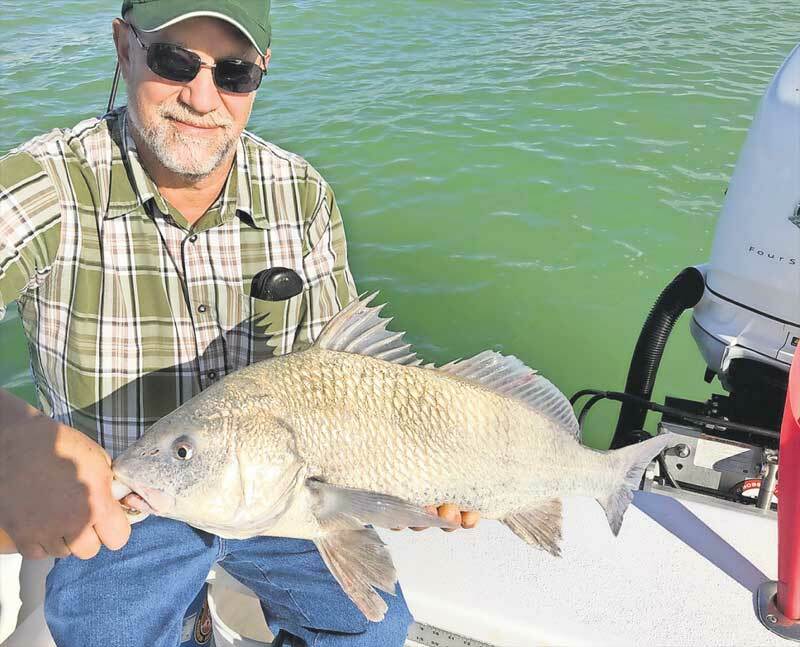 When the wind blows and the Gulf waters are too rough, it’s time to target sheepshead, black drum and redfish around inshore reefs, bridges, docks and canals. On my Southernaire excursions, we are watching wind patterns. The sheepshead bite is on the upward swing as water temps are settling into the lower 60s. Baiting live shrimp combined with a knocker rig is working well. Using this combination around rock piles, wrecks, docks and other structure is yielding good amounts of sheepies. While fishing reefs and wrecks, I’m seeing quite a few mangrove snapper on the hook. Black drum and catch-and-release redfish also are being caught, especially around residential docks and canals. This type of fishing is good on cold, windy mornings when running the boat in open water is less comfortable. And, as a bonus, I’m hooking up with a few catch-and-release snook and an occasional keeper flounder. Capt. Warren Girle is working nearshore structure in the Gulf of Mexico on calm days, venturing out 5-8 miles for some good action. Dropping live shrimp on a knocker rig around ledges, reefs and wrecks is resulting in numerous species, including mangrove and lane snapper, sheepshead, grunts and porgies. Moving inshore, Girle is using live shrimp as bait and casting around rocks and docks. Residential canals with seawalls and docks are host to sheepshead, black drum and redfish, and casting live shrimp in these areas is sure to attract a bite. Capt. Aaron Lowman is working nearshore ledges and reefs with good results. Cruising out to 50 feet of water, he’s finding a good bite on snappers, porgies and grunts, as well as some catch-and-release grouper. Tripletail are being spotted in these depths, too. Moving inshore, Lowman is fishing docks along the Intracoastal Waterway for action on sheepshead, black drum and catch-and-release redfish. Capt. 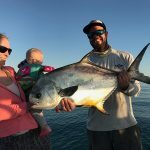 Jason Stock reports he’s putting anglers on 40-50 pound amberjack while fishing offshore wrecks. Also in these areas: mangrove snapper, catch-and-release gag grouper and some keeper red grouper. Moving inshore on days when the winds are too strong to fish in the Gulf of Mexico, Stock’s clients are bagging sheepshead and black drum. Fishing residential canals and docks, as well as rock piles in Tampa Bay, is producing the bite. Jim Malfese at the Rod & Reel Pier says sheepshead are dominating the bite there, as live shrimp attract sheepies of 1-3 pounds to the hook. 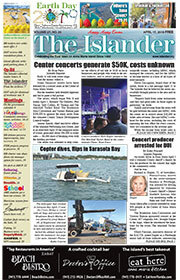 While targeting the sheepshead, pier fishers are hooking into black drum, flounder and some catch-and-release redfish. 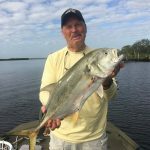 Using jigs tipped with shrimp is working for pompano, although timing is crucial. Capt. David White of Anna Maria Charters is running clients offshore on good days for the mangrove snapper bite. For bait, he says live shrimp and frozen sardines work well. To really get the bite fired up, White is chumming and feeding bait on a hook. Mangrove snapper up to 20 inches are being taken in this fashion. Also, while offshore, White is hooking up with red grouper, amberjack and an occasional African pompano. Moving inshore, White is catching his share of sheepshead, black drum and catch-and-release redfish. Using live shrimp on a jig head or knocker rig is proving successful. Black drum in the 15-pound range and reds up to 30 inches are being caught. Capt. Eric Chaignet of Gulfcart charters is doing well on mangrove snapper and hogfish. Both are being caught around rocky breaks and ledges while offshore. Catch-and-release gag grouper are also in the mix. Moving inshore, Chaignet is putting clients on sheepshead, along with black drum, mangrove snapper and catch-and-release redfish. For rigging, Chaignet likes using either a knocker rig or jig head combined with a tasty piece of shrimp.